The area was developed into a residential area for rulers and administrators the early 1800s, when headquarters of the Portuguese government were shifted to Panjim from Old Goa due to sanitary problems and outbreaks of the plague. Prior to this, it was apparently used as a coconut plantation by an affluent Goan expat. The significance of the curiously named streets in Fontainhas is interesting. Rua 31 de Janeira (31st January Road) relates to the date of Portugal's independence from Spain on January 31, 1640. Bustling 18th June Road, lined with shops and restaurants, was named after the date in 1946 that Ram Manohar Lohia (an activist for Indian independence) called a meeting that led to the end Portuguese rule in India. Art lovers should head to Gallery Gitanjali located adjacent to Panjim Inn. It has a collection of contemporary art and Scandinavian lithographs, lino prints and etchings from the 1950s and 1960s. Poetry readings, art discussion groups and courses on film appreciation are also held there. Plus, there's a cafe. Shop at Velha Goa Galeria for gorgeous traditional hand-painted ceramics, including azueljos (tin-glazed ceramic tiles). The well-maintained Chapel of Saint Sebastian, built in 1800, sits at the southern end of Fontainhas and has a number of interesting artifacts. These include a large crucifix that used to hang in the Palace of the Inquisition in Old Goa, a statue of the Virgin Mary that's originally from the High Court, and three intricately-carved altarpieces relocated from a church in Diu (which once formed part of the colony of Goa). An old well is also attached to the Chapel. Climb Altinho hill to visit the attractive tangerine-colored Maruti Hindu temple, dedicated to Lord Hanuman, and you'll be rewarded with a scenic view over the Latin Quarter. Make it Happen conducts an outstanding Fontainhas Heritage Walk that will immerse you in the area and Goa's past. As well as gaining access to heritage homes, you'll be able to meet a renowned local Goan musician on the tour. The cost is 700 rupees per person. If you're there on Christmas, attend their special Christmas Evening Walk in Fontainhas. There's a special Christmas feast and brass band. What better way to immerse yourself in the heritage of Fontainhas than by staying in one of the Portuguese mansions. There are accommodations for all budgets. Boutique: The impeccable La Maison, tucked away on Saint Sebastian Chapel Road, has eight elegant rooms and a gourmet European fusion restaurant. Expect to pay about 5,000 rupees per night upwards, with breakfast included. Mateus is a beautifully restored 1879 Portuguese mansion on 31st January Road. It has nine guest rooms starting from 3,000 rupees per night for a double. 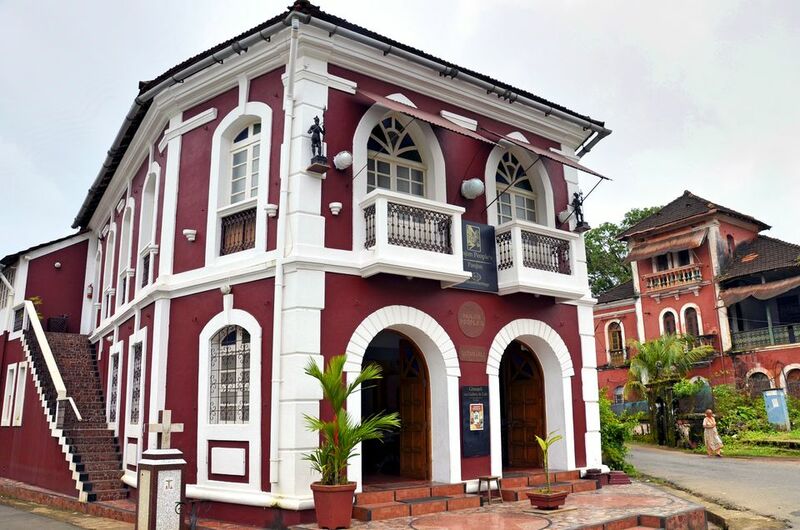 Iconic: Welcome Heritage Panjim Inn, built in the 1800s, was one of the first big mansions of Fontainhas. It's been owned by the same family for five generations and nostalgically restored to retain the feel of the bygone era. There are 24 unique rooms decorated with period furniture and antiques. Rates start from around 5,000 rupees per night for a double. Breakfast is included. Bed and Breakfast: Hospedaria Abrigo de Botelho, housed in a lovingly restored 150 year old Portuguese homestead that was turned into a bed & breakfast by local realtor Roy Botelho. He's the perfect host. There are eight rooms spread over two floors. Rates start from about 3,000 rupees per night, including breakfast. Homestay: Carvela Homestay, themed on a 15th century Portuguese ship. It's run by a welcoming father and son duo, and has a cafe that serves tasty Indo-Portuguese cuisine. Family and suite rooms are available. Rates start from around 2,500 rupees per night. Guesthouse: The groovy and quirky Afonso Guest House has a convenient location in the Latin Quarter, with many bars and restaurants nearby. The owners live next door and are always available for assistance. There are seven rooms. Rates start from 2,500 rupees per night. Breakfast, served on the leafy rooftop terrace, is additional. Hostel: The Old Quarter Hostel is perfect for sociable young backpackers. Bicycles are offered on rent for exploring the area. Expect to pay 600 rupees per night for a bed in a mixed or female-only dorm. Private rooms are available from 1,700 rupees per night. The standard basic ones are in a separate 200 year old building nearby. The lively, award-winning Viva Panjim on 31st January Road serves yummy Portuguese and Goan cuisine. On the same street, Hotel Venite, with its art graffiti walls, has an unforgettable ambiance. It's popular with locals and travelers. Drop into cute little Cafe Morango in a heritage home on 31st January Road for tea, coffee, shakes, sweets and snacks. Try the chorizo pao (goan sausage in bread). A hearty English breakfast is served too. Overlooking the river on Rua de Ourem, Horse Shoe is renowned for its authentic Portuguese cuisine. It's evocatively located in a lovely 300 year old house. A couple of minutes walk away, on Gomes Pereira Road, Joseph Bar is an old local establishment that's been recently restored to its former grandeur. This intimate and hip hangout is only open in the evenings from 6-10 p.m. Try the feni cocktail. To splurge, head to The Verandah at the Panjim Inn. It oozes Indo-Portuguese charm. Soho Goa, on MG Road, is the place for those who prefer to be somewhere hip and happening. This new designer bar sits above a music store in a 19th century building that used to be a lodge. It's open nightly from 7 p.m. and even has a dance floor. If you're particularly interested in Goa's Portuguese heritage, take this Private Tour of the Braganza House and Palacio Do Deao. It includes a stop at the fascinating fish market in Margao.